Today is the first day of April, but I have no tricks or hoaxes here in my blog. I do have one on my webcomic, however. I have too many things going on right now, which troubles me a bit. I'm having difficulty making sure the comics get done along with my GitHub Game Off 2015 entry while at the same time making sure I keep my day job and not neglect my family. Here are my latest updates. I had to do something foolish for the 1 April comic. It's a technology company tradition to release phony products, absurd announcements, and generally silly ideas. The frogs had to join in. 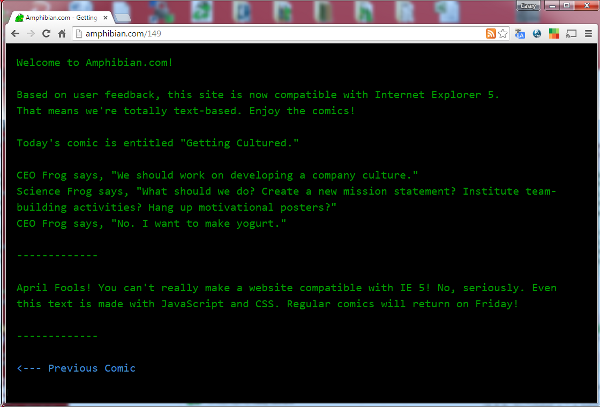 So I replaced the comics with text today - to finally make the site compatible with Internet Explorer 5. But of course, that's not really possible. I used the jQuery plugin Typed.js to create the manually-typing-the-comic-transcript-in-a-terminal effect that graces the site today. In general, I liked Typed.js better than the alternatives but it was not without flaws. I was a little disappointed that I couldn't get the cursor to work the way I wanted, and you can see parts of the HTML tags appear briefly as it types. Still, I like how it turned out. 1980's terminal? Or today's Amphibian.com? 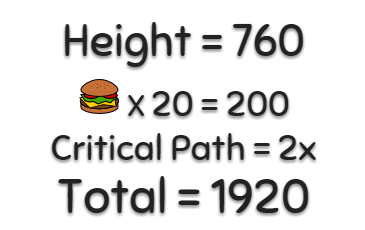 Over the last few days, I also found a couple of minutes to add a critical path bonus to the frog jumping game. Since the game is supposed to represent Business Frog jumping through a Gantt chart, I decided that the red platforms should represent the critical path. Hitting several of them in a row results in an additional bonus multiplier at the end of the game. Jump on every red platform in the order in which they appear and you can get really crazy multipliers which lead to really crazy scores. My wife, who has never been subjected to a Gantt chart, constantly reminds me that she wants the high scores to work at the end of the game. I'm going to try to get to that this weekend, but it means adding a server-side component. I'll probably try to make something really lightweight using Node. She also suggests I replace the hamburgers with coffee. I'll probably do that too. I still have to fix the frog jumping sprites too, but the game is coming along well. The competition ends on April 13th. Unfortunately that's all I have to talk about today. And there's no picture of a comic at the bottom here, because the comic has to picture today. But I'm sure there are plenty of other fun things to find on the Internet.